Wendy’s, the world’s third largest burger joint, is having a makeover. From being “Wendy’s Old Fashioned Burgers” we’re now told it’s just “Wendy’s.” The ginger-haired befreckled Wendy remains on the logo, though in their TV spots she’s a hipper twentysomething. Yet behind the new facade lie some very old-fashioned attitudes. Above all, like every corporation, Wendy’s exists for the sole purpose of bringing value to its shareholders. This is why shareholders at Wendy’s Annual Meeting in New York last Thursday found themselves in the company of Kerry Kennedy of the Robert F. Kennedy Center for Human Rights, and Larry Cox, Executive Director of Amnesty International. Kennedy, Cox, and an interfaith group of clergy, joined the Coalition of Immokalee Workers (CIW) to demand that the company join a program to eliminate the exploitation farmworkers in its supply chain. One might imagine that Wendy’s cares little about conditions in its supply chain because it is, after all, a burger company. But, visit Wendy’s investor relations online and you’ll see that they care enough about their suppliers to ensure that their packaging is somewhat compostable, and that their animals aren’t treated too badly, before they’re turned into square burgers. The farmworkers who supply Wendy’s with the fresh tomato slices on those burgers appear, however, to be less important than the company’s ground beef. I’ll say it again, things had been so extremely bad that multiple instances of modern-day slavery have been prosecuted in Florida’s tomato fields in recent years. Finally, Wendy’s might sniff that there’s nothing it can do, since it can’t police hundreds of suppliers directly. But in the words of a major Presidential Advisory Report released last month concerning human trafficking, the CIW’s Fair Food Program is “one of the most successful and innovative programs” in the country today for preventing forced labor. Rather than join their competitors in respecting farmworkers rights, the company ended up doing something different. They chose to mislead their stockholders and customers. 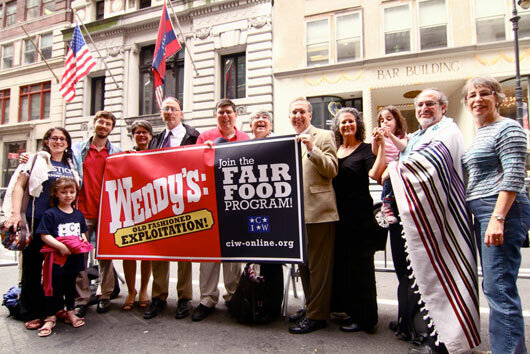 When human rights activists asked Wendy’s CEO Emil Brolick why his company had refused to join the CIW’s Fair Food program, he said that Wendy’s was already purchasing its tomatoes from growers in the Fair Food Program. He also said that they were paying a premium for their tomatoes. Wendy’s is not participating in the Fair Food Program …. Wendy’s has not signed a fair food agreement with the CIW. Wendy’s is not paying a penny premium to increase workers’ pay. And Wendy’s has not committed to using its purchasing power to eradicate abuses in the fields together with growers and farmworkers. Wendy’s refuses to commit to joining the Fair Food Program, undermining the concrete commitment and contributions of the eleven corporations that actually areparticipating and creates a misleading picture for its shareholders and customers. So here’s where the new Wendy’s looks very much like the old-fashioned Wendy’s. The company is ignoring a program that has demonstrably helped workers, which has been joined by the likes of McDonald’s, Taco Bell, Burger King and Subway, and which has been embraced by people of all faiths, and recognized from the White House to the U.N. Working Group on Business and Human Rights as the way of the future. It can have all the make-overs it wants, but without joining the Food Program, its claims are as empty as a fast food calorie, and its old-fashioned approach looks increasingly outdated.